Reading the news yesterday morning, I found out about another shooting in the US – a tragedy that seemingly happens every couple weeks now. When I then looked at different news sources on Twitter and how people responded to the news, all I could think was ‘these people are talking past each other with no chance of reaching their opponents’. The reason for this was, seeing that gun policy is a highly ideological and polarizing topic, that each party made their case from their own perspective based on their personal values. Think of a disagreement you had with a friend. Maybe your friend wanted you to see the new Thor movie, you however were disappointed with the last movies and didn’t want to go. Your friend tells you how much better this one is, talks about the special effects and reminds you that it’s a Marvel movie after all. Although you’re not 100% convinced, you agree to give it a shot. Here’s a different scenario: Your friend argues that people with a higher income should pay lower taxes. He makes the point that lower taxes mean potentially higher profits and new investments. You, on the other hand, are concerned with the growing wealth inequality and wealth redistribution. In this scenario, changing your mind is more difficult because the value (equality) being challenged is closely connected to your identity and the counterarguments did not resonate with your core values. Whereas going to the movies only costs you the ticket price, changing your mind about tax policies will require to update your personal belief system. 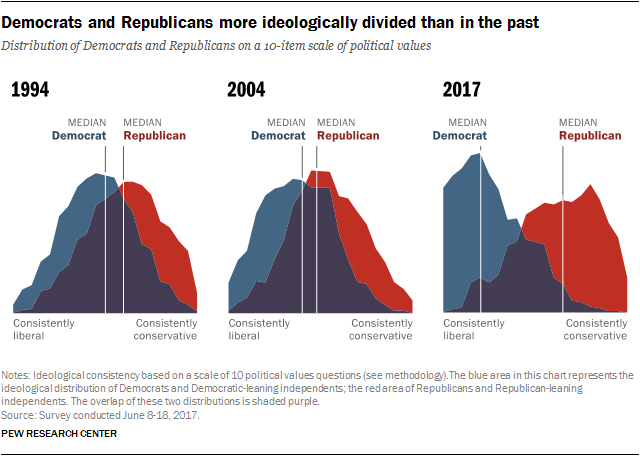 Seeing the growing ideological (and political) divide and polarization in American society, it becomes understandable why it is so difficult to have effective discussions: Both parties argue from two completely different standpoints that represent two different sets of core values. The things I read on Twitter yesterday morning showed exactly that. Reoccurring arguments for conservatives opposing stricter gun control laws reflected typical conservative values, such as personal responsibility, limited government, empowerment of the individual, and family. The 2nd Amendment grants US citizens the right to bear arms. We need guns to protect our families and ourselves. From a conservative perspective, mass shootings rather reinforce their core values and strengthen their arguments against gun control. They are more likely to dismiss the easy availability of guns as a plausible cause for shootings because they assign responsibility to the gunman. Plus, shootings heighten their sense of protecting themselves and their families. In fact, “Protection” ranks highest on the list of reasons for owning a gun1. A push for stricter gun policies then triggers anxiety about being incapable to defend themselves. Liberals, on the other hand, see it as the government’s duty to protect its citizens. Their arguments emphasized government action to solve the problem and a strong government to protect US citizens. Stricter gun control, saves lives. It’s the duty of the government and the police to protect us. The 2nd Amendment does not give you the right to bear arms, it refers to the right to keep a militia. So, the problem we are facing is the result of a deeply polarized society that is drifting further and further apart ideologically – the differences outweigh the evidence and persuasion becomes nearly impossible. And to be honest, I was sitting on the train yesterday morning trying to re-frame liberal gun control arguments for a conservative position and it was really difficult for me. But here are some starting points. Since conservatives greatly value their freedom and personal liberties, using the term ‘gun control’ easily triggers their defense mechanism and their fears of having their guns taken from them, limiting their constitutional rights and increasing government control. Gun safety is a less laden term. Conservatives believe in individual responsibility, so it might be good to appeal to responsible gun ownership that includes extended background checks, gun training and socialization before being allowed to buy a gun. This is a tricky line of argumentation though because it might still be seen as government control over a constitutional right due to the more difficult acquisition conditions. If you want to have an engaging and efficient discussion with the opposition, make sure you know what gun policies you are talking about: concealed carry, gun shows and private sellers, licensing laws, gun registration, banning assault-style weapons, etc. People opposing stricter gun laws are obviously care and are passionate about their weapons, you should have some basic knowledge about guns in general and be familiar with different policy aspects, otherwise it might be difficult to maintain your already weakened credibility. Yet, the most important thing is that if you want things to change, either by passing new laws or by better enforcing already existing laws, you have to take action. At the moment there is no political counterpart to the National Rifle Association (NRA) that has equal power and influence. Gun owners are not only more likely to contact their public official to tell them their opinion on gun policy and do so more frequently, but they are also more likely than non-gun owners to give money to an organization that takes a position on policy (28%|10%)2 like the NRA. About 19% of US gun owners belong to the National Rifle Association1. Of these Republican and Republican-leaning gun owners are twice as likely as their Democratic counterparts to say they belong to the NRA1. So seek difficult conversations, pick up the phone, and use your voice.